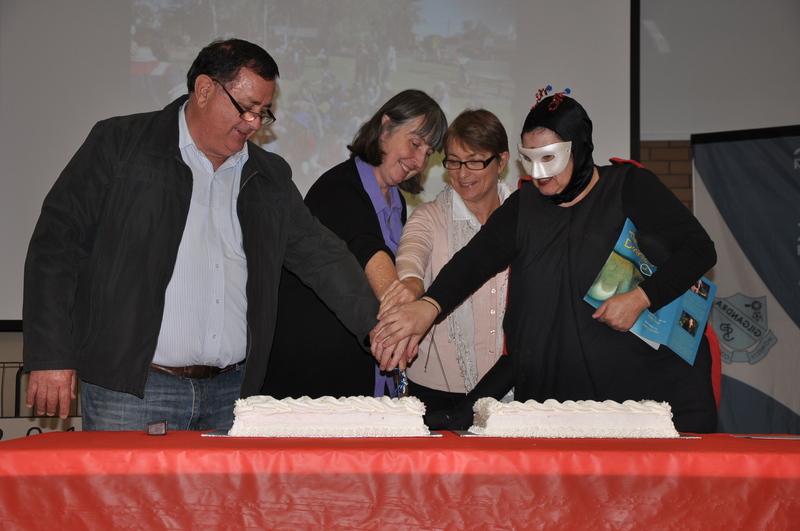 The Mayor of Gilgandra Shire, Doug Batten, cutting the celebratory cake with Liz McCutcheon, Librarian, Lyn Greenhalgh (the Creative Director of GREAT for the past 10 years) – and of course the irrepressible REaDing Bug. Gilgandra REaDs Everywhere Around Town celebrated its 10th Anniversary this week with a celebratory dinner on Thursday night 21 May, followed by the GREAT Day on Friday. The GREAT Day celebrated the GREAT themes over the past 10 years, including REaDing – it’s Out of this World (drawing dinosaurs and learning to write their names), REaDY, Set, REaD relays, and Alison Lester’s ‘Are We There Yet?’, with huge murals of scenes across Australia. The town was a sea of red, from the main street to the preschools,schools, clubs and motels and everyone wearing red, to show that they were well read! Congratulations to the whole community of Gilgandra.